The Nexus 9 is a pretty mediocre tablet. For $400, it's nothing special. But if Google bundled every single one of them with this awesome keyboard case, I bet they'd sell much better. The $130 Nexus 9 Keyboard Folio looks like what you'd get if you crossed one of Apple's iPad Smart Covers with the keyboard from a Surface Pro. Except where those items only protect the front of their respective tablets, the Keyboard Folio covers both. On one side, you've got the three familiar microfiber-lined panels that can fold up into a kickstand, and on the other there's a full physical QWERTY keyboard ready to type all the emails you can bear. Between the two is a narrow strip that houses all the electronics, including the micro USB port you'll only need every few months to top off the internal battery. Sounds simple so far, right? There were only two surprises for me: how fantastic it is as a keyboard, and how iffy it is at actually holding the device. Setup couldn't be easier: just tap the top of the Nexus 9 against that strip, say "Yes" to the prompt on the tablet's screen, and you're done. Built-in NFC automatically turns on the tablet's Bluetooth and pairs the two devices without saying another word. Align the tablet flat against the three-piece panel to start, then kick out the tablet's bottom lip towards the top edge of keyboard where magnets snap it into place. The kickstand can prop it up at two different angles if you like. It's still a little top-heavy, but balanced well enough that I can usually rest it on my lap without worrying about it tipping over. And gosh, does this little keyboard have some great little keys. I never would have believed that a keyboard this tiny would offer anything close to a comfortable typing experience, but I started banging out sentences in no time flat. The keys have a surprising amount of travel—even if the layout's the teeniest bit cramped—and the slightest bit of force pumps out those letters. It's better than many full-size laptops I've used. No joke! 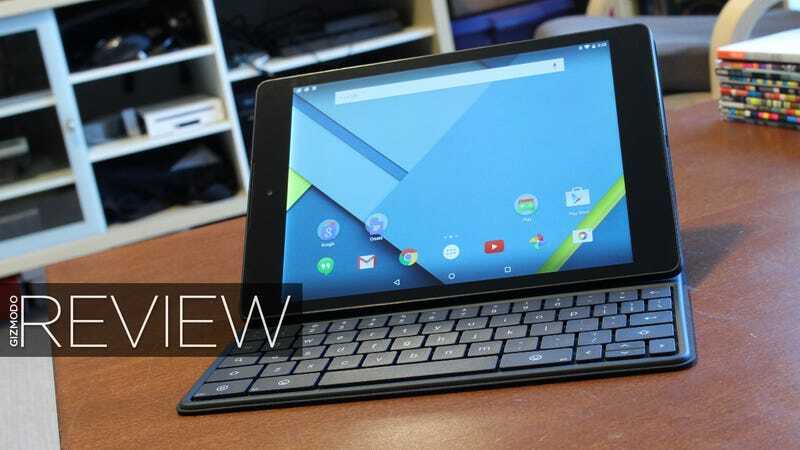 I wrote this entire review with the Nexus 9 keyboard, and I don't regret that decision one bit. Especially because I was able to do it without disrupting my workday. I generally spend my days in Chrome, Slack, Trello, Evernote, Google Drive and TweetDeck, with some Pandora Radio pumping out tunes in the background and the occasional Facebook message soaring by. The Nexus 9 keyboard let me Alt-Tab to switch between those tasks and also Cut, Copy, Paste, Undo, Bold, Italicize and Underline with the same Ctrl+Letter shortcuts I use on Windows all the time. Well, except in Gmail for Android where you can copy/paste but can't style text. Boo. Sure, one-app-at-a-time task switching isn't optimal when I could run all those things on my Windows machine side by side—particularly since Chrome annoyingly needed to reload my tabs almost every time I switched back—but I was surprised how much I could get done on an Android tablet with a combination of native apps, web apps, and a good keyboard for typing. It just goes to show how powerful a platform Google might have if it manages to merge its Android and Chrome operating systems at some point. It also makes me really sad that Tweetdeck doesn't have a native Android app. Waiting for the other shoe to drop? The Keyboard Folio just isn't that good at staying attached to the Nexus. The magnets don't hold onto the back of the tablet anywhere near as strongly as the ones in the iPad Smart Cover or the Microsoft Surface's Type Cover, and it feels unreliable. And there's nothing holding it to the front of the tablet at all: just a flat plastic keyboard against a flat glass screen. When I carry it around, I hold it underhanded because I'm afraid the precious tablet might slip right out. Not only does the folio put the tablet to sleep when you close it, it's also smart enough to shut off the keyboard when you fold it flat against the back of the tablet. You know, if you want to use your Nexus 9 as a tablet instead of a miniature laptop. The magnets feel too weak. The tri-fold kickstand design isn't quite as stable as I'd like. I also really wish I could prop up the screen just a little bit more. Neither viewing angle is quite right for my normal sitting position. I'd often instinctively pull the screen towards me, only to have it flop right back down. The Android notification tray often asks me if I'd like to change the keyboard layout. The answer is always no. Weird how some keyboard shortcuts use the Ctrl key, but others use Search. No good way to right-click in Android, which can be pretty important for certain kinds of work. Trying to use the Nexus 9 as a laptop throws the Nexus 9's weaknesses into sharp relief. That flickering LED backlight. That pause when launching apps. That boring design. No thanks. If you've already committed to a Nexus 9 and you really, really like it, this optional keyboard case might make you like it even more. 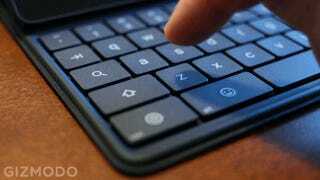 Particularly if you've got an LTE version: add this keyboard and you can get quite a bit done on the go. But there's no way I'd buy a $400 Nexus 9 and then spend an additional $130 on a keyboard unless it also came with one heck of a steak dinner too. For $530, you can buy a better tablet than the Nexus 9, a cheap Windows convertible, or a Chromebook with cash to spare. If Google bundled it with the tablet for $300, maybe $350 combined? Then we'd be talking. If not, I sure hope Google and HTC recreate these wonderful keys for a more affordable, desirable Android tablet in the future. And give it some better magnets, too. I love a good physical keyboard, and this experience reminds me that Android could use one, too.